Daily Illuminator: Put Your Mind To The Impossible, With GURPS! May 30, 2018: Put Your Mind To The Impossible, With GURPS! When mental matters meet magical might, the unimaginable becomes within your grasp. 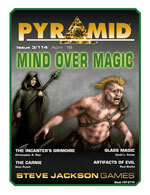 Pyramid #3/114: Mind Over Magic focuses on arcane abilities that are subtle or strange. Super-charge your imagination and unlock new worlds of power by downloading this issue today, from Warehouse 23.